Industrial papers describing industrial experience, case studies, challenges, problems and solutions (maximum 8 pages). Please submit your paper online through EasyChair (see the GREENS website). Submissions should be original and unpublished work. Each submitted paper will undergo a rigorous review process by three members of the Program Committee. All types of papers must conform to the ICSE submission format and guidelines. All accepted papers will appear in the ACM Digital Library. Fate of the World: Real Science. Real Consequences | Fate of the World. I’m particularly intrigued by the fact that Myles Allen (famous for climateprediction.net and the Trillionth Tonne study) was a consultant in the game design. Does this mean it brings on board some of the dynamics in the latest GCMs? The Guardian previewed the beta version of the game back in the fall, but they don’t appear to have actually played it. PC Gamer magazine did play it, and concludes that it really does succeed in it’s goal of making people thinks seriously about the issues. Here’s an interesting opportunity for young coders. The Climate Code Foundation is a mentoring organisation this summer for the Google Summer of Code. 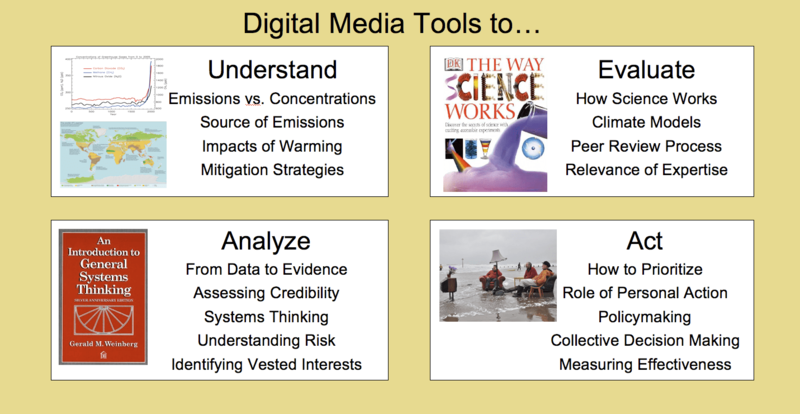 The British Columbia provincial government has set up a Climate Change Data Catalogue, with open access to data such as GHG emissions inventories, records of extreme weather events, and data on energy use by different industrial sectors. They recently held a competition for software developers to create applications that make use of the data, and got some interesting submissions, which were announced this week. Voting is open to vote for the people’s choice winner until Aug 31st. How easy is it get off our fossil fuel habit? What do the fundamental limits of physics say about sustainable energy? Could a typical “developed” country live on its own renewables? The technical potential of renewables is often said to be “huge” -but we need to know how this “huge” resource compares with another “huge”: our huge power consumption. The public discussion of energy policy needs numbers, not adjectives. In this talk I will express power consumption and sustainable production in a single set of personal, human-friendly units. Getting off fossil fuels is not going to be easy, but it is possible. The book itself is brilliant (and freely available online). But David’s visit is even more relevant, because it will give us a chance to show him a tool our group has been developing to facilitate and share the kinds of calculations that David does so well in the book. We started from the question of how to take “back of the envelope” calculations and make them explicitly shareable over the web. And not just shareable, but to turn them into structured objects that can be discussed, updated, linked to evidence and so on (in much the same way that wikipedia entries are). Actually, the idea started with Jono’s calculations for the carbon footprint of “paper vs. screen”. When he first showed me his results, we got into a discussion of how other people might validate his calculations, and customize them for different contexts (e.g. for different hardware setups, different parts of the world with different energy mixes, etc). He came up with a graphical layout for the calculations, and we speculated how we would apply version control to this, make it a live calculator (so that changes in the input assumptions propagate like they would in a spreadsheet), and give each node it’s own URL, so that it can be attached to discussions, sources of evidence, etc. We brainstormed a long list of other features we’d want in such a tool, and we’re now busy creating a first prototype. What kind of tool is it? 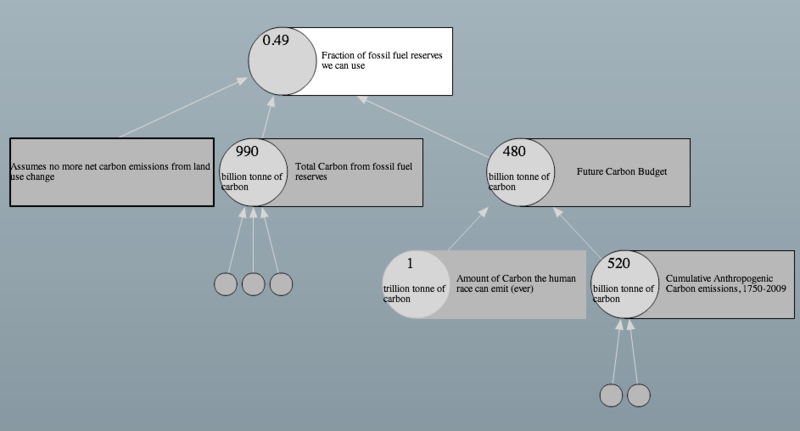 My short description is that it is a crowd-sourced carbon calculator. Because I find existing carbon calculators to be very frustrating, because I can’t play with the assumptions in the calculations. Effectively, they are closed-source. Just perfect for bringing the science to the masses down the pub.